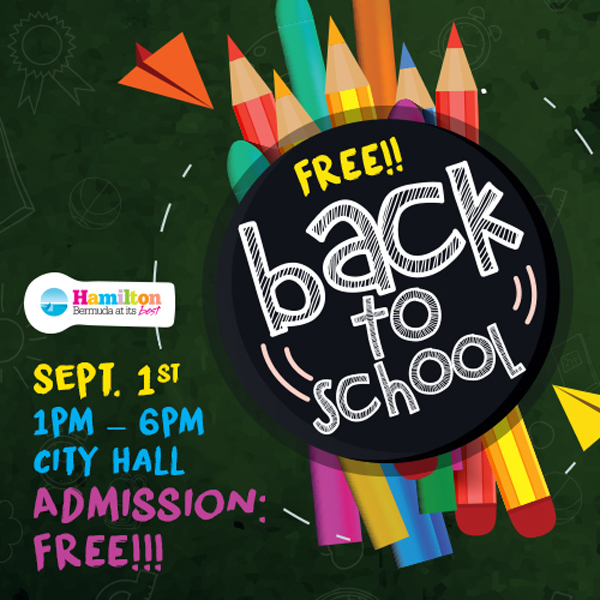 The City of Hamilton will host a Back to School event at City Hall this Saturday, September 1st from 1pm – 6pm. The event will offer up free school supplies, frees haircuts and hairdos and there will be entertainment and games to enjoy with prizes and gift vouchers from local retailers to be won. Glenn Jones will host the event with the Simons Brothers, DJ Coolie, Gombey Evolution, and steel pans providing the afternoon’s entertainment. Extreme Sports will be on hand providing competitive games and there will also be bouncy castles from Twilight Entertainment. Local salons/stylists Sunkissed Hair & Henna and Made 2 Fade will provide free haircuts for kids, the ever-popular Ashley’s Lemonade and Duch Pops will keep the crowd cool with their refreshments and Sensational Delights will offer some hot food. Event Coordinator Thomas Lightbourne, said, “This is the second Back to School event we are hosting here at City Hall. We all know that the end of summer can be tough on our youngsters after a couple of months of fun but we hope this event makes that transition a little easier. For more information about Back to School, visit the City’s website.